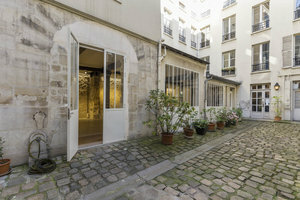 This modern 133 sq m showroom in the fashionable area of Haut Marais is perfect for Fashion Week Showrooms, creative events and private meetings. 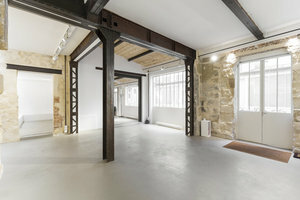 This venue is housed in a historic building and has a quiet and private entrance. Divided over two rooms, the space has a creative and sophisticated atmosphere. The white and black graphic interiors are tasteful and an eclectic mix of furniture adds versatility to the space. 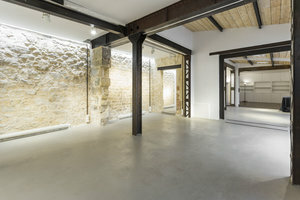 Exposed stone walls with wooden panelling, steel beams and modern spotlights give an artist's studio feel. 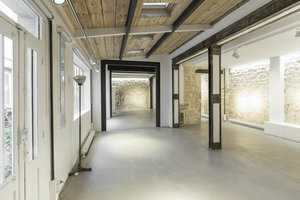 Situated in an ideal location close to Rues de Bretagne, des Archives and de Turenne, this space is advantageously located for Fashion Week events.